Kristi L. Jackson is the co-owner of one of very few Black-owned trucking companies based in Houston, Texas. It's called October Fourth Holdings LLC, and with her partner, Kevin Muhammad, they provide daily freight logistics and transportation nationally - including trucking services, moving services and supplies, and bulk materials! 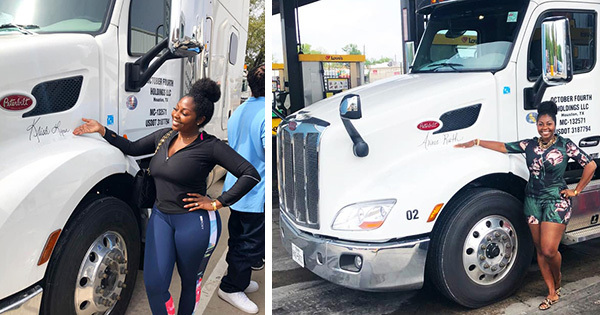 As a Black woman that owns a trucking company, Kristi is making history and further solidifying what many federal statistics have already confirmed - that Black women currently represent the most successful demographic of entrepreneurs in the United States. Kristi is originally from Alexandria, Louisiana but now resides in Houston, Texas where she runs her company. She is also the founder of the Woman CEO Project, a global think tank and business development company built specifically for women entrepreneurs. This organization hosts over 40 business courses every year. Kristi says she has either consulted with and/or is affiliated with consult or be affiliated with major companies inluding JP Morgan & Chase, Wells Fargo, IBM, Apple, Google, Microsoft, Capital One, and even The White House. She has also won several major awards including the “2013 Women’s Organization of the Year” and “2012 Humanitarian of the Year”. Regarding her trucking company, which by the way is looking to hire new drivers, she comments, "We are growing our fleet. We have a 5 year goal of how we’re going to do it. I’m really proud of us. This business requires a lot and we are up for the challenge." By looking at her social media posts, its obvious that Kristi fully understands the value of hard work. She comments, "People fall in love with the outcome, but try to avoid all the work involved."